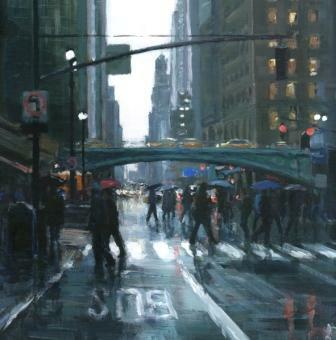 ''Passing Through Grand Central Station reflects David Farren''s love of cityscapes, as he says: "Since visiting New York for the first time in 2000, I have found a real passion for depicting urban day-to-day scenes and trying to capture the energy and drama of city life. I was overwhelmed by its scale and vibrancy and have returned several times since to express the different moods of the city in paint. I also have a great fondness for European cities with their mixture of old and new architecture. I like to concentrate on the people as they go about their everyday business and try to capture moments of everyday life." Farren is fascinated by the way that varied light affects a scene, and his distinctive use of colour is an essential part of reflecting this. In ''Passing Through Grand Central Station'' figures glide through a haze of golden light and reflections.